5793 labyrinths found. Showing 5521-5540. Sorted by country, state, city, then zip/postal code. Topologically, the middle five circuits of an eleven-circuit classical, with expanded center. 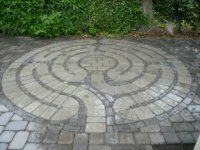 See our web site for directions and much more about our labyrinth. 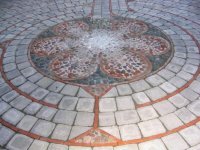 Portable 36-foot canvas Chartres labyrinth. Have labyrinth, will travel! Copied from the turf labyrinth formerly at Boughton Green, England. 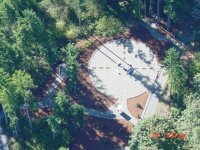 The labyrinth is located in the trees in front of the church next to the parking lot. The Rose Labyrinth in the center of the fenced community garden. Open/available the first Friday of each month. 5:30 p.m. to 7:00 p.m. in the social hall. 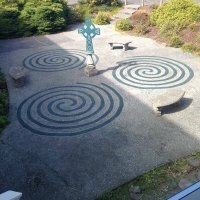 A classic 7 circuit labyrinth, of stones, on a lawn, with a striking view over the Strait of Juan de Fuca, nestled in tall trees. Hard to find the first time. Call for directions. Kristen and Bill Larson, plus others carrying stones. Share the peaceful woods with migratory birds, watch the eagles soar over the sheep's pasture and enjoy your journey to the center of the "Bird Woods"
MayHill Farm is hosting an open house for our wooded labyrinth July 12th 10am-4pm. Come and walk the labyrinth, see some art and the farm, have a drink of lemonade and spend a peaceful afternoon. Admission and parking are free. All are welcome. 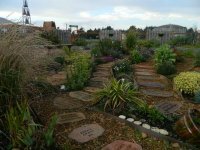 The labyrinth will be open to the public on the 1st Saturday of each month. The open house is on July 12th. The MayHill Farms labyrinth resides in the "Bird Woods" of our farm. It is sheltered by alder, fir and maple trees. Made completely from the wood of the past year's tree fall, it is a natural expression of the beauty of our farm. It has 3 circuits that bring you to a lovely rest in the center. Available for public walking, 3rd Sunday of the month. Please call to set up time. Jim and Rae Hight are the owners of this labyrinth. The church is located on the corner of Jefferson and Tyler streets. 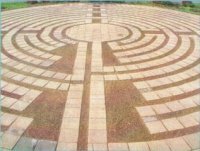 The labyrinth is in the Courtyard of All Souls between the church building and the parish hall.